The ground floor has oak flooring and the front door opens into the sitting room. Sitting Room: a charming room with beamed ceilings and an open working fireplace with a pamment tiled hearth. There are two sofas, chair, coffee table, freeview digital TV/DVD. There is a wide archway which leads though into the kitchen and dining area. Kitchen: has a beamed ceiling and modern cream fitted units with a built-in dishwasher, electric oven, halogen hob and a microwave. There is a dining table with a bench and chairs to seat 4. Rear hall: has a fridge with smaller freezer on top, the door to the back garden and the stairs. Bathroom: has a bath with an electric shower over, hand basin, WC and a washing machine. Bedroom 1: a good-sized room with two windows to the south overlooking farmland. There is a king-size bed, bedside tables and lamps, a chest of drawers, chair and a clothes stand. En-suite bathroom: with walk-in shower, hand basin and WC. Bedroom 2: has views across the garden and farmland. It has twin beds, bedside tables and lamps, chest of drawers and a built-in wardrobe. There is a small paved area at the front of the cottage and off-street parking for 2 cars opposite the front door. 10 out of 10 for the cleanliness and the garden upkeep. We liked the enclosed garden for dogs, a bathroom each for us and fabulously comfortable beds. We just loved it all! Lovely Cottage convenient for exploring Norfolk with a great pub 5 minutes away. 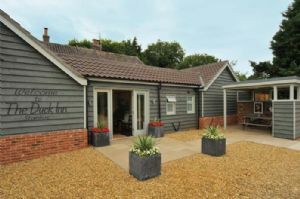 Lovely cottage convenient for exploring Norfolk with a great pub 5 miles away. Good central location for all North Norfolk quiet position with countryside views. Thank you, we had a wonderful stay. Lovely Cottage. We particularly liked the uninterrupted views from the front of the property and the location in general.